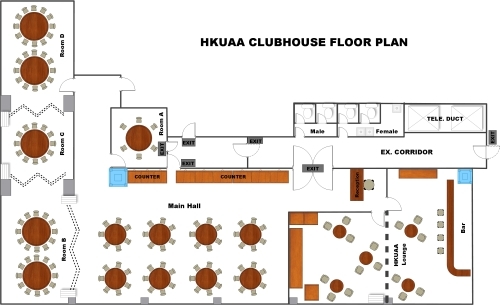 HKUAA Clubhouse also provides for Banquet and Meeting facilities for private functions organized by members. The Main Hall is a cozily layout dining area which serves highly recommended Chinese cuisine in lunch and dinner. It can be partitioned into function rooms for meetings and Chinese banquets. We offer set business lunch, signature dishes and seasonal chef’s recommendation. Lunch and dinner at the Clubhouse are very popular amongst members. We invite you to book in advance! The HKUAA Clubhouse is also catered to members’ need to host private banquets and meetings. Please find hereunder capacity of the Main Hall and its various partitioned functions rooms. (Chart and Table 1). Advance booking is strictly required and is subject to availability. Minimum room rental applies. For booking and enquiries, please contact our Manager Mr. Lau Chi-on at 2522-7968. Other HKU alumni groups wanting to have their regular meetings at HKUAA Clubhouse could check out here for special arrangements. 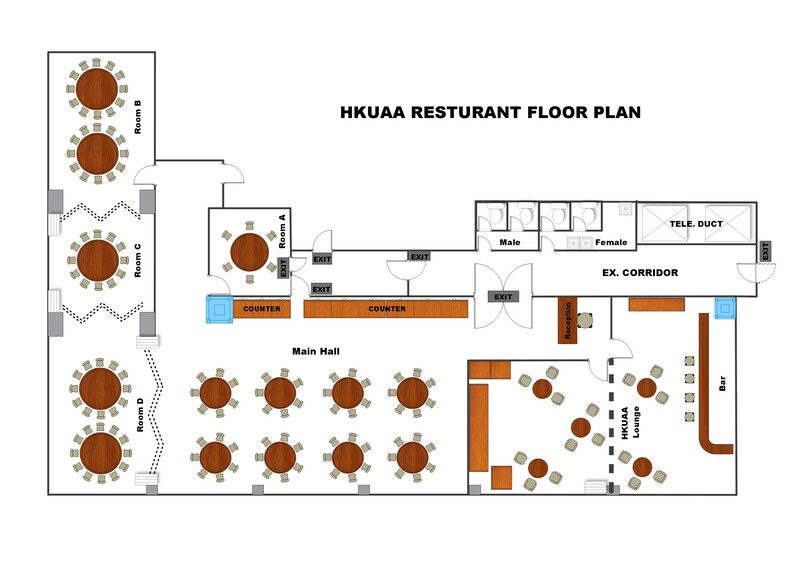 Members in using the Catering Services at our HKUAA Restaurant and Bar may be required to show their Membership Cards in person where necessary. Any replicated forms, e.g. photocopies, photos in iPhones, etc. are not accepted. Members are reminded that booking of room(s) and table(s) should be made well in advance to ensure availability. In making the reservation, they should give their full names and membership card numbers for our Booking Record. Any cancellation of such bookings should be made at least 3 days before the actual date of the meal. In order to be fair to all other members who would like to enjoy our catering service -- any incident of member's " no-show " will be entered into our Booking Record. Any repeated incident of " no-show " may result in the member being barred from the convenience of advance booking. If a Member has made a reservation in less than 3 days but wishes to make a cancellation, the Member should do so as soon as possible and in any event the cancellation should be made BEFORE the actual date of the meal. Failure to do so will be considered as "no-show" and will be entered into the Member's record in making reservation. 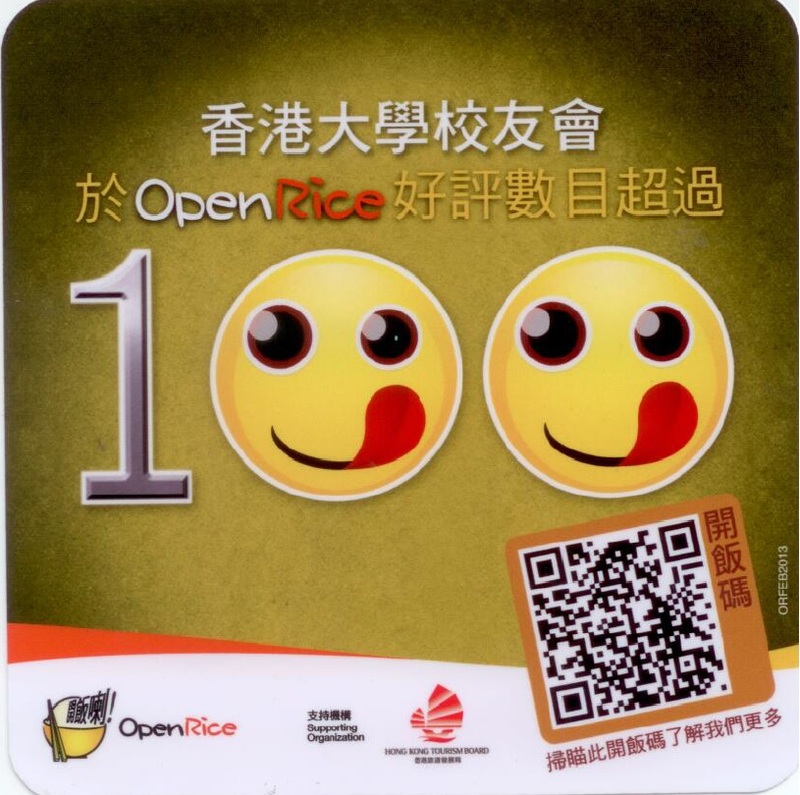 HKUAA received over 100 positive comments at OpenRice.com and has been granted by OpenRice with an Honourable Sticker as a compliment to us. Thank you for our members' continuous support. Corkage fees* will be charged to wines brought for consumption at the HKUAA Clubhouse. Cake cutting fees* will be charged.